All parks and protected areas (ppa) are important in local and regional economies and help fulfil commitments to quality citizen experiences, environmental conservation and sustainability. 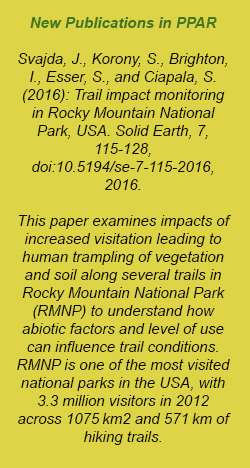 These effects, prominent in western Canada's rocky mountain park system and Eastern Slopes, are important for decision-making about ppa and research needs. Sustainability of environment requires access to knowledge and understanding for decisions about parks and protected areas. The Parks and Protected Areas Research Group (PPARG) has identified one clear goal that seeks to understand the feasibility of creating a repository of ppar that will store information, data and publications for access by professionals and practitioners for the region. Access to such research has been deemed problematic since research about ppa is being performed by governments, academics and non-profit researchers, with little ability for the information to do much more than reach a small and specialized group of readers. 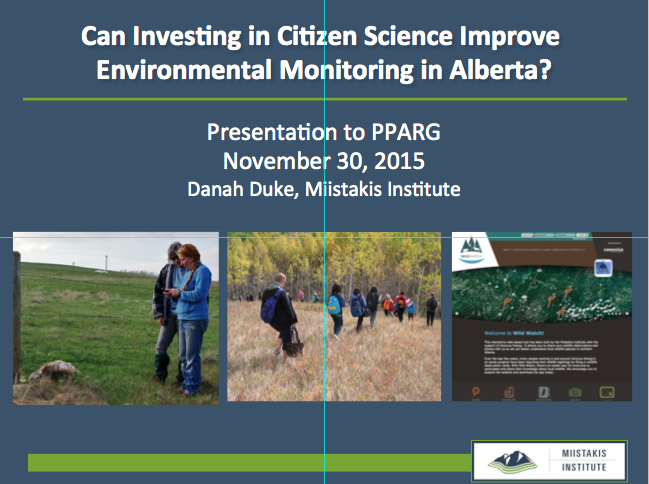 Therefore, it is the motivation of PPARG to determine what gaps exist for research about parks and protected areas, what research is available, centralize it, and make it all available to researchers and practitioners that are interested in topics related to protected areas, especially in Alberta. It is also the goal of this scoping project to eventually provide recommendations for a site and repository where interested people may go to access this information and remain current about issues related to Albertan ppa. These goals have been determined with thorough discussion between members, and with a final observation, that there exists no one system or group that has assumed the role of data acquisition, centralization and dissemination of research about parks and protected areas in Western Canada. 3) the development of an integrated repository to centralize existing and ongoing data bases for access by researchers and park practitioners. 4) the centralization and compilation of current data about the Eastern Slopes to present in a useful and accessible format. This initial, and scoping feasibility study, is being supported by the Institute for Environmental Sustainability (IES) at Mount Royal University, Calgary. ICMOD is pleased to share a news ‘First ever air quality monitoring for Chitwan National Park’ issued today relating to the inauguration of the Chitwan National Park Air Quality Observatory on 26 December 2015 in Sauraha, Nepal. Read more here. REDD and Atmosphere Initiatives of the International Centre for Integrated Mountain Development (ICIMOD) collaborated with the National Trust for Nature Conservation (NTNC) to establish the observatory. It will help monitor air pollution at the national park periphery to provide a basis for studying air pollution impact on biodiversity and ecosystems. Under Western Skies Conference takes place on Sept 27- 30th, 2016. The Parks and Protected Areas Research Group proposes to host a concurrent session featuring four papers presented by its members. This will be immediately followed by a poster session, with refreshments. The purpose of the two sessions is to raise awareness of the PPARG’s scope, goals and activities. Contact Katty Rettie, kmrettie@gmail.com, for more information. Meeting Date and Time: Friday March 18th, 3 - 5 p.m.